EDGUY - MONUMENTS LTD. EDIT. (2CD+DVD DIGI) | Online Shop | Wizard LTD. Album: "MONUMENTS LTD. EDIT. (2CD+DVD DIGI)"
- СТАРА ЦЕНА: 38.00 BGN!! 25 years of EDGUY - a silver anniversary that demands celebration! This doesn’t mean that the ultra-fashionable Tobias Sammet will be sorting through his wardrobe of stage gear on this occasion. No, it means something else – something much better: This autumn, Sammet and original members Dirk Sauer (guitar) and guitarist Jens Ludwig (guitar), as well as his groovy rhythm section of more than 20 years, Tobias Exxel (bass) and Felix Bohnke (drums), will present their greatest hits on the »The Best Of The Best« tour. As a prelude to this, the upcoming double CD/DVD package »Monuments« will be released on July 14th, 2017. It will feature not only 22 carefully-selected highlights from the band&apos;s catalogue, but also five (!) brand-new tracks, which showcase EDGUY at their best! The collection will be completed by the previously unreleased ‘Reborn In The Waste’, which dates back to 1995 as part of the »Savage Poetry« recordings. But if you look back now, you realise how lucky we were! It’s now time to celebrate our anniversary with our fans. We&apos;ll celebrate our quarter century with the release of »Monuments« and LIVE in some selected cities! We&apos;ll perform a best-of set list, a journey throughout our past, with a lot of fuss and at full throttle! The first quarter century is over and we want to honour these years with our fans! To the next 25 years!" Not only thanks to this attitude, the band has built a huge and loyal fan base all over the world. 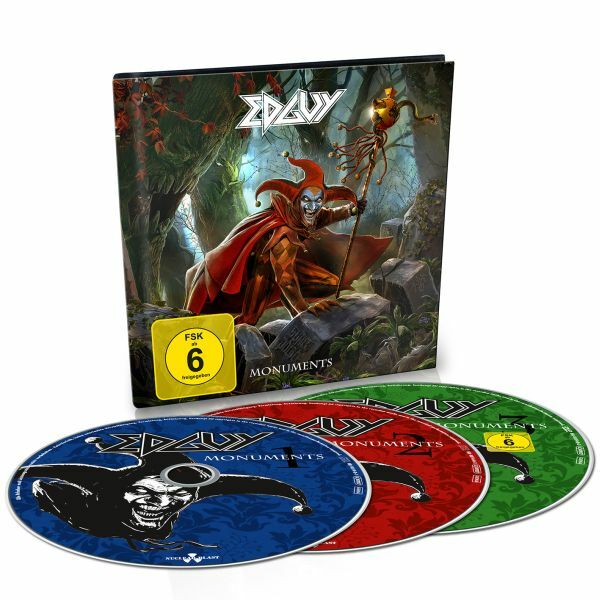 In the 25 years that EDGUY have been in business, they have formed their own, immediately recognizable style without letting themselves get stuck to a rigid pattern. They have played countless concerts in over 40 countries and stormed the charts with their albums. The Germans have achieved a lot and still plan more - but first, they are going to celebrate their jubilee with »Monuments« and the accompanying tour!